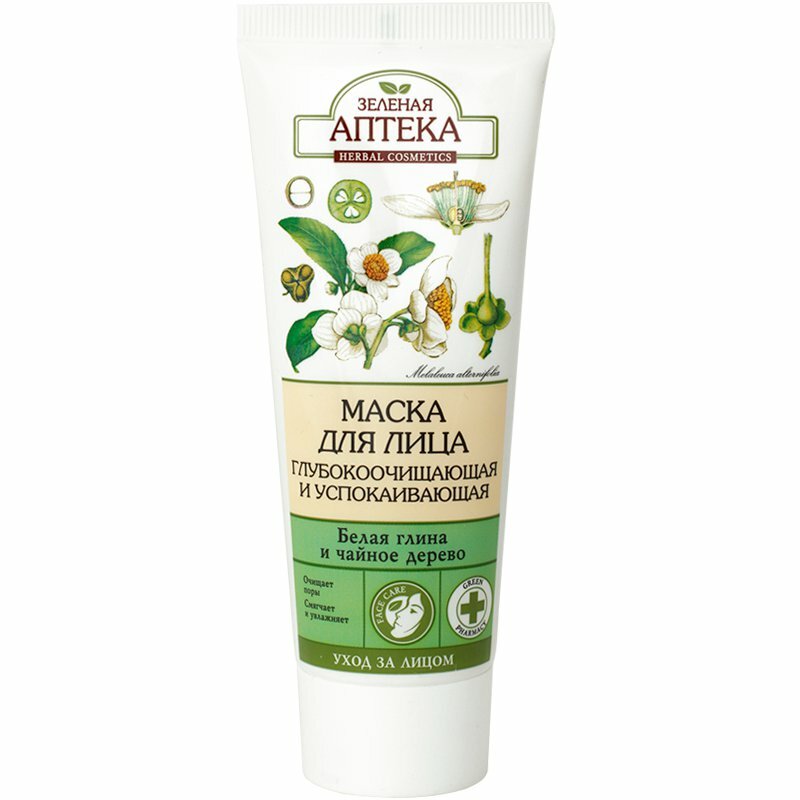 Cleansing and Soothing Face Mask is produced by the Ukrainian beauty brand Green Pharmacy. The product is enriched with kaolin (white clay) and tea tree essential oil. It helps to unclog pores, removes dirt and excess sebum, softens and moisturises the skin. The mask is formulated with kaolin that helps to regulate sebum secretion and has a great matte effect. It keeps your skin fresh and prevents it from looking greasy. The product also contains tea tree essential oil which has an antibacterial and healing effect on the skin. The mask is enriched with natural extracts from garden rose, guelder-rose, American witch-hazel, white willow and white oak. These extracts have a toning and soothing effect on your skin. They make it softer and help to relieve irritation and inflammation. They also have antibacterial properties and thus help to cope with acne. Directions. Apply onto clean skin of your face and neck, except for the area around the eyes. Leave for 15–20 minutes, rinse with warm water. Use 2–3 times a week. The mask may cause a slight tingling sensation on the skin during the first two minutes. Ingredients. Aqua, Kaolin, Paraffinum Liquidum, Stearic Acid, Glyceryl Stearate, Cetearyl Alcohol, Glycerin, Potassium Cetyl Phosphate, Melaleuca Alternifolia Leaf Oil, Salix Alba Bark Extract, Rosa Odorata Flower Extract, Hamamelis Virginiana Leaf Extract, Quercus Alba Bark Extract, Pyrus Malus Leaf Extract, Viburnum Prunifolium Extract, Retinyl Palmitate, Allantoin, Panthenol, Helianthus Annuus Seed Oil, Sodium Hydroxide, Parfum, Propylene Glycol, Phenoxyethanol, Methylparaben, Ethylparaben, Propylparaben, Butylparaben, Sodium Benzoate, BHT. Want to buy Cleansing and Soothing Face Mask? Call us or submit your order via our web site!